In the last post on number studies, we started talking about single color trains and a few of the multiplication activities we use to study an individual number. This post will nearly wrap-up single color trains for the number 11 - we still have one more post to go. The textbook I'm using for this is Gattegno's Textbook 1. We're in chapter 6. 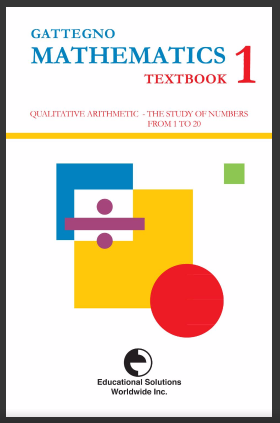 You can find a free copy of the textbook here. 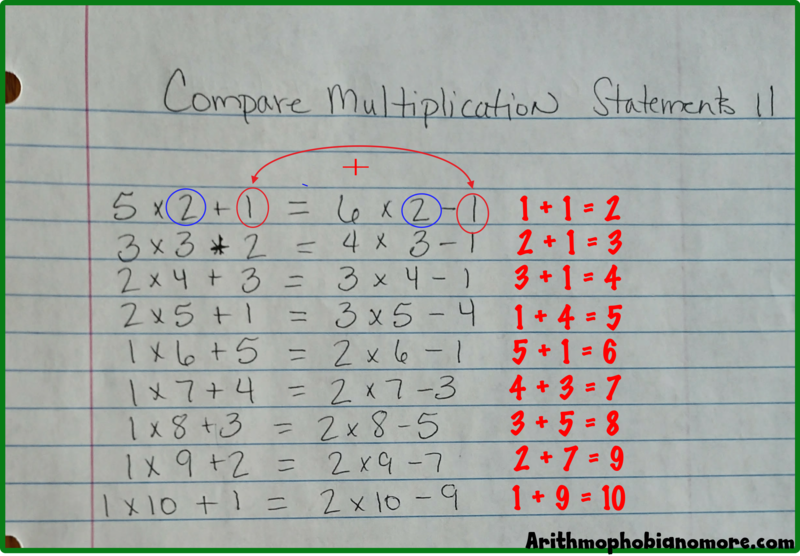 Unlike the other multiplication activities, this one is pretty simple and only needs to be done a few times. You want the student to develop a strong awareness how remainders, surplus, deficiencies, multiplication and division are related. This is very much tied into fractional remainders from my previous post on number studies. Task: In the last lesson, we made single color trains for 11 and added the deficiency here. By deficiency, I mean the difference between the multiple and the number 11; how much more is needed to make it to 11. We want to get that list from our math notebook and copy it onto a new sheet. We noted from our previous studies that 11 is a prime number. It always sits between two consecutive multiples, for instance, 5 x 2 and 6 x 2. We want to take the list we made previously and make an equal statement with the next consecutive multiple minus the surplus. What I mean by surplus is the amount we need to remove that is more than 11. 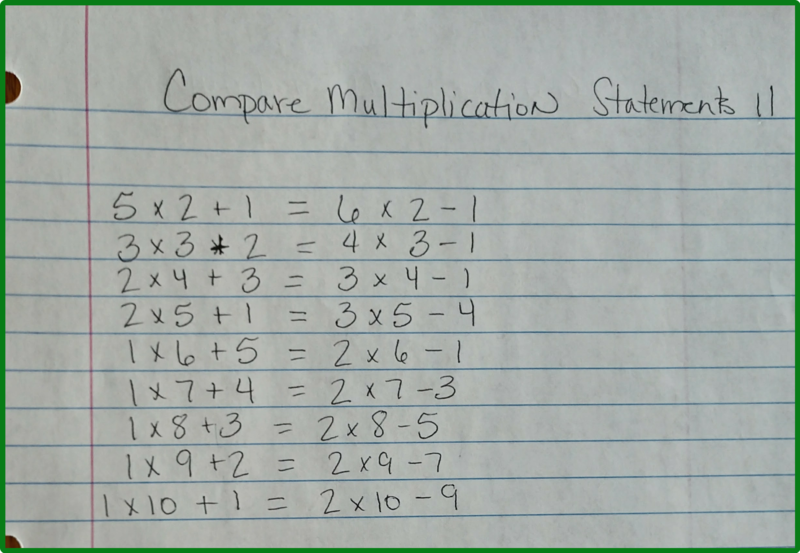 We're going to make a list to compare the two series of multiples. Starting at 1 x 6 the second term counts + 1 to 10, while the third terms counts -1 back to one. Starting at 2 x 6, the third term makes a staircase that counts by 2 starting with one. They are all odd. He expected that there would be as many deficiencies of 1 as there are surpluses 1 but there are more surpluses of 1.. There are no deficiencies of 9 only surplus 9's. No deficiencies of 7 either, just surplus 7. 2, 5, and 10 have a deficiency of 1. 2 x 5 = 10. 3 and 9 have a deficiency of 2. 3 x 3 = 9. 2, 4 and 8 have the same deficiency. 2 x 4 = 8. The above do not have the same surplus. Becoming Aware - What's Going On with Multiples? All the noticing the P. did above got him very close to the awarenesses I wanted him to have, but he failed to recognize one crucial thing. I decided to provoke the awareness for P. I asked him to add up the last two numbers of each statement in each row. It wasn't until he reached 1 + 9 = 10 that he realized that the sum of the last terms in each statement, the surplus and the deficiency, was equivalent to the second term in each statement. For those of you who don't remember < reads less than. I always have trouble with the greater than and less than symbols. I love those little alligator things and I know that the open mouth faces the largest number. I wish I would have had them when I was a kid. I digress. Here we have the natural development of mathematical notation based on the current studies in front of us. We aren't introducing arbitrary notation without a connection to our student's experience, but it grows out of the student's observations. Strong connections are made between the relationships of the symbols to one another in addition, subtraction, multiplication and division. Notice, we haven't used a worksheet yet.